I'm still trying to wrap my mind around the different reasons why Greece left such an indelible memory in my mind. Maybe it was the crystal clear blue water, the beauty of which was lost in the darker blues skies. Or maybe it was the majesty and glory of Greek culture and history. I actually had to stare at the Parthenon for a few minutes to realize that it was the real thing towering in front of me, and not some replica building that most of us encountered around the world. Going out for dinner, however I realized that, like in Spain and Italy, it was the food that glorified and celebrated this wonderful country and its people. You just had to have a big smile after such incredible meals in extremely simple, yet charming restaurants. One thing that I particularly remember were the octopi hanging in perfect symmetry on a clothes line, left to dry, or soak up the flavorful air. And then, right after the foil wrapped feta cheese with rosemary, our first appetizer, which in Greece is called "ορεκτικό" pronounced "O-re-kti-KO" , a sumptuous plate of fresh octopus with potatoes and fresh extra virgin oil of olive; yes, Greek, olive oil...!! Thank goodness for friendly people and a semi-decent cook book I picked up from the Athens airport. Now I'm able to try to replicate that memory, even if I know that, no matter how hard I'll try, I'll never get close to it. So let's try ! Defrost the octopus if previously frozen. Peel the garlic and chop finely. Rinse and chop the parsley In a large sauce pan, stir oil, garlic, parsley and crushed red peppers (I will put ½ teaspoon) and let it simmer. Rinse the octopus and put it in a saucepan with the carrot, celery and onion. Cover them with water and boil for about 40 minutes (check the with a fork if tender). Let them cool in the cooking water. Drain the octopus and let it dry, then cut into pieces and toss with the flavored oil preheated. Add salt to your taste (do not overdo with the salt because the octopus has already a salty taste.) Rinse the potatoes and boil them whole and then peel. Cut them into pieces and add to the octopus mixture. Serve the octopus warm or cold with the potatoes.I like a chilled white wine, possibly nice dry white wine like a Chardonnay. 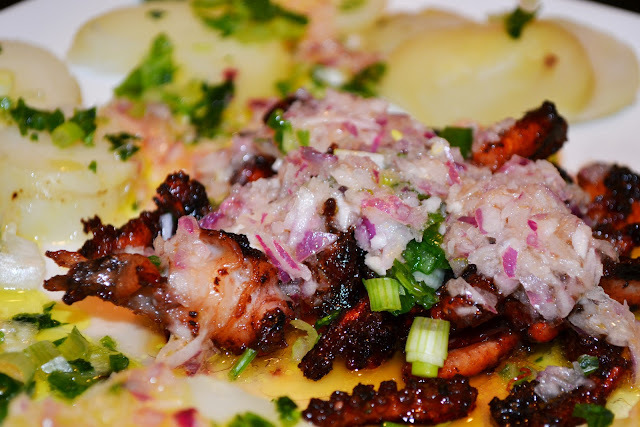 Greece really is magical, and nothing reminds me of Greece more than octopus. I think we had it every day when we were there... simply grilled, in salad, all sorts of ways. This one sounds fabulous! That's a very simple recipe and yet the food is healthy. I should definitely try it sometime. Thanks. I'm glad you shared the ingredients of this food. I'll definitely try the recipe. I love Greek cuisine, thank you for sharing the recipe. I tried this out and it was so delicious. I shared this did with my mother in law and she liked it very much. My mom loved this dish, she said it was amazing. This looks so lovely. I bet it taste just as great. Your plating looks very lovely. Thank you very much for sharing. The onions on top makes the dish more tasty. I'll probably try the recipe you gave. Thanks! I used squid instead because I couldn't find some octopus, thank you for the recipe.